Hundreds of pollutants can contaminate your tap water, but one inexpensive kitchen addition will ensure that yours is clean for drinking and cooking: a faucet-mount water filter. Here, how to choose one fit for your needs—and your sink. More than four out of every 10 Americans use a home water treatment unit of some sort, according to the Water Quality Association and the Environmental Protection Agency (EPA)—and for good reason. Clean drinking water is an essential building block of general health. With hundreds of pollutants in most drinking water, including lead and arsenic, finding and installing the right filter is one of the most important things you can do to your home to ensure wellness in your household. While available in a variety of types—carafes, faucet attachments, under-sink mounts, and countertop varieties—the water filtration system that proves most versatile and easy-to-install is one that mounts to any standard kitchen faucet and filters right as the water flows. (By contrast, an under-sink model requires a direct hookup to your plumbing system, and a carafe has to be refilled almost constantly, occasionally making you wait for cool water to filter through the full pitcher before you pour a glass.) So if ease and convenience is up your alley, look no further than this variety. As you select one to fit your kitchen sink, consider the following key variables as well as the best faucet water filter options to date. Find the right filter for your needs. Water contaminants vary by community, and knowledge is power. Start by researching what’s affecting your own water supply through the National Drinking Water Database created by the Environmental Working Group (EWG). Once you have an idea of the contaminants you’re exposed to daily, you’ll be better able to determine your needs. When it comes to the mechanism that makes water filters work, there are two types: reverse osmosis and carbon. • Reverse osmosis is considered to be the Cadillac of water filtration—superior at removing contaminants (including those too small for other filters to catch, like arsenic and perchlorate) but pricier and so bulky that they’re often installed under-sink. These are not an option for faucet water filters, but available to you should you decide that the filtration best meets your household needs. • Carbon filters still remove a handful of noteworthy contaminants (pesticides, disinfection byproducts, and—depending on the model—possibly lead, as well as protozoan cysts like giardia and cryptosporidium) from your drinking and cooking water, but at a much more affordable cost and in more convenient models. And, ultimately, mounting a carbon filter to your faucet for $20 to $50 makes your drinking water far safer than the tap water that currently flows. Always check a unit’s package or online information to make sure the contaminants you’re most concerned about won’t make it through the system you end up investing in. Regardless of which microscopic materials they’re best at keeping out of your glass, a vast majority of faucet-mounted filters considerably improve the taste of your H2O. Ease of setup. A faucet-mount attachment generally offers a quick installation. 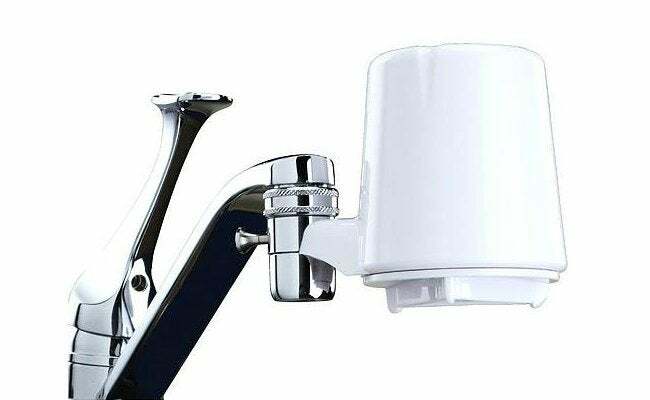 Unscrew the aerator, swap in an adapter provided with the faucet-mount water filter (models often include multiple sizes to find one that best fits your faucet), then snap the body of faucet-mount filter into place. Manufacturer instructions will also cover how to check that the filter inside the model is good to go. In most cases, it’s only a matter of minutes to get the filter fully functional. Once installed, many faucet water filters offer the option to toggle between filtered and unfiltered water. Note: While some custom faucets and pull-out models may not allow for a perfect installation, faucet water filters are made to fit most standard kitchen sinks. When in doubt, check with the filter unit’s manufacturer before you buy. When it comes to reputable filters, most carbon-based point-of-use attachments will protect your water (and you!) from a great number of unwelcome ingredients. We’ve scouted the market for you for which models have been reviewed as the best faucet water filter in the business by experts and consumers alike—as well as where you can get your own. 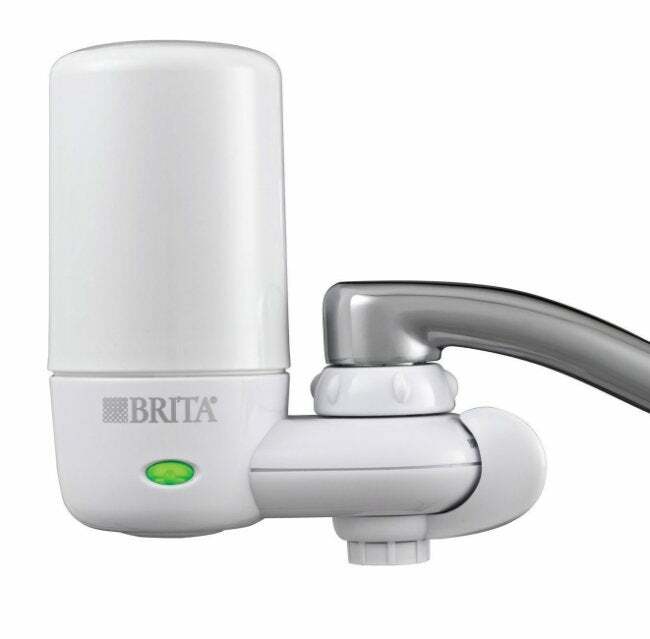 The no-tools-required assembly of the popular Brita FF-100 faucet filter make it a favorite among Home Depot shoppers, not to mention the fact that it’s 40 percent more space-efficient than competitors on the market. While it’s highly effective at removing lead and chlorine, in particular, the faucet water filter greatly improves water’s taste as well. And since a filter does no good without regular replacement, its handy green light indicates when the carbon filter needs replacing—a process that’s as simple as just one click. Available at Home Depot. Reducing or entirely eliminating lead, mercury, pesticides, pharmaceuticals, and more than 60 other particulates, the PUR FM-3700B has garnered glowing reviews from more than 2,000 consumers for its sleek design, one-click installation, 360-degree swivel, and general durability. Adept at improving water’s taste as well as quality, its only real drawback is the fact that it won’t work with pull-out or hand-held faucets. It comes with a two-year warranty. Available on Amazon. After weighing t his models pros and cons thoroughly, the team at ConsumerSearch declared the Culligan FM-15A faucet-mount filtration unit a top-of-the-line model. 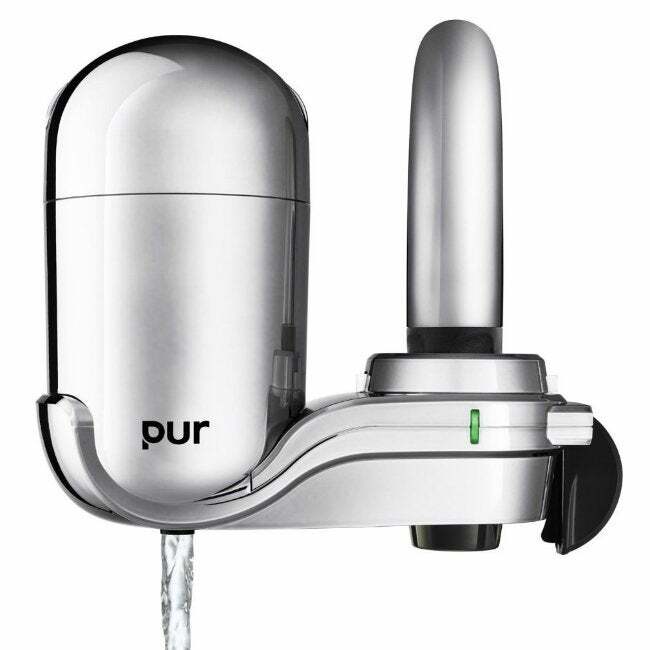 While it lost points for aesthetics and low flow (both common issues cited with faucet-mounted filters), the unit’s durability, cost, ease of installation, and simplicity of use earned it high marks—as did the fact that it vastly improved the way water tasted. In a nutshell, the ConsumerSearch editors conclude, “Bells and whistles take a backseat to filtering performance.” Unfortunately, this unit doesn’t fit all faucets, so buyers would be wise to check with Culligan’s customer service about compatibility first. Available on Walmart.com.